The working-service-creative class distinction. Is this fully an aspect of privilege? Why–because of connection to educational opportunities? I stumbled across this graph earlier today. Though Yglesias uses it to make a different point, I was struck by how closely the unemployment line of the creative class mirrors that of college graduates. 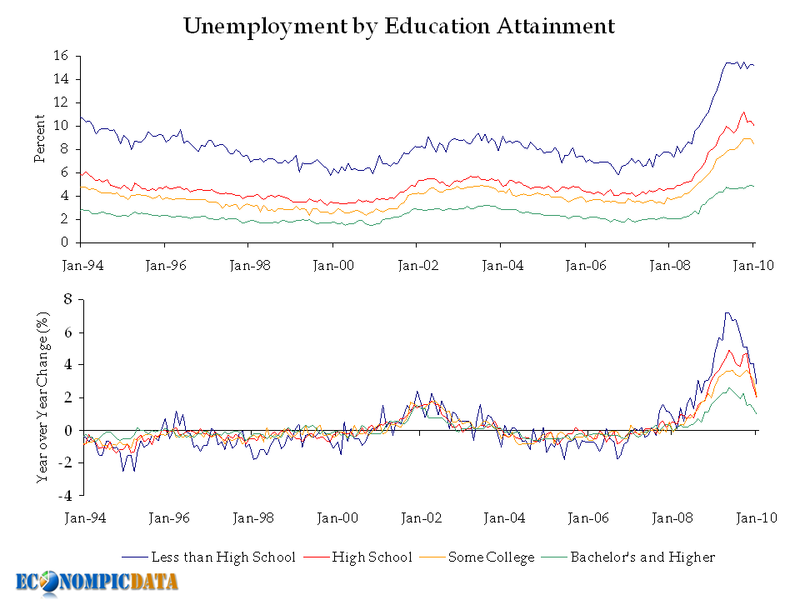 I know putting two graphs side-by-side doesn’t mean anything about their relationship, but it doesn’t make me take back my assertion that you can trace job class back to educational attainment back to socioeconomic status. UPDATE: since most of you are seeing this in Google Reader and not on the actual blog, I’m comparing the graph above with the one below (not the two graphs above with each other). Sorry, team. I follow the unemployment numbers–in general, but also by race and gender–pretty closely. And they’re not good. Overall unemployment is disheartening, but the racial breakdown is another reminder that we’ve got a long way to go. In January 2010, White unemployment was 8.7%. For African Americans, it was 16.5%. For African American men, the percentage climbs to 17.6. And scroll back to this summer. White youth unemployment hovered around 25% but African American youth unemployment nudged 50%. No matter what time boundaries you draw, African Americans are twice as likely to be unemployed as Whites. The disparity is incredible. But it wasn’t until stumbling into Roger Martin’s work at the University of Toronto’s Rotman School of Management that I realized a huge part of why I haven’t felt the high unemployment levels in my peer group–even across race. By his definition, we’re all in the creative class. And even now, unemployment in the creative class is just crossing the 4% threshold. Once you commit to naming your privilege, the list never ends. Sorry for the light posting, folks. I’m on the road for the next month with only intermittent Internet access. I’ll check in when I can but in the meantime, enjoy Flying Whale. 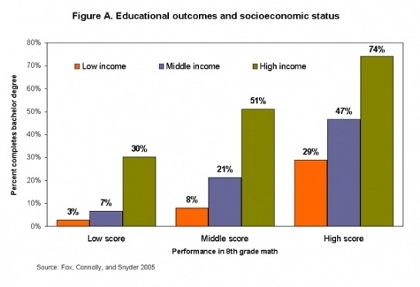 many low-income students who had high math performance still didn’t complete college. The percentage of college completion for low-income, high math students was still lower than high-income, low math students. I was lucky enough to get a sneak preview last week of some forthcoming research on labelling students academically talented/gifted and–at least in Georgia–the results echo the ones above. Kids’ chances have more to do with their SES status and the quality of their school than, you know, their intellectual ability. Once you throw race into the mix–it’s almost impossible for a poor African American at a bad school who is academically gifted to be identified as such. If I remember correctly, their chance is something like 1.8%. I’ll post that study here as soon as it becomes available (and edit that number if need be). Obviously, the solutions that make college graduation more attainable for poor students and the policy and attitudinal changes that would level the nomination and testing process for being identified as academically gifted are quite different. But I’m adding both sets of data to my response arsenal when someone insists we have a merit-based education system.